I understand that the flowers have all bloomed and spring is in the air. I know what that signals to creatures across the land. And before I continue further, let me make sure you know how much I appreciate your existence. I thank you for your pollination skills, your hand in honey creation, and the relaxing buzz you create as you zoom around. I especially adore your sense of humor. I remember the last time I watched a woman scream in absolute panic as you swarmed around her head. I remember that child who just wouldn't leave you alone and you gave a little love tap. I probably shouldn't have laughed, but it made my day a little brighter. So I hope you don't take offense when I ask you to fly a little higher. Although I don't mind you flying around my head most times, I know you get a little distracted when you fancy a fellow bumblebee. Love and lust overcome you and the desire to reproduce fills your heads. 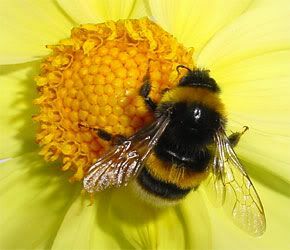 It's only natural for two bumblebees tangled up as one to fly like they're drunk. "Drunk on love" would be too cliche....but I know the pure lust can be overwhelming and you probably don't even see what's in your path as you zip around in hurried circles. I see it, though. In fact, you've landed in my face, poked my eyes, and even almost slipped into my mouth multiple times in the last couple days. I don't see how either of us can benefit from me accidentally swallowing you. So when you begin your adventures, please consider starting at a higher altitude. Add to your cliches and get "high on life" up there. Really, the view is amazing and it could only add to your experience....and mine.